Yes, fantasy sports are much beloved not only by regular ole sports fans, but by data and numbers geeks, who eagerly ply sports with every known statistical algorithm or formula to get the best teams. Fantasy football happens to be the most popular among fantasy sports enthusiasts, but there’s a fantasy league for just about every sport imaginable. As a data-driven pursuit, a multitude of sites have popped up over the years that aggregate the latest sports news, statistics, and everything in between to help owners get a leg up on their teams, many even apply algorithmic projections (like numberFire, which launched at TC Disrupt) to the reams of data. Yahoo Sports and CBS SportsLine were among the first big companies to launch fantasy web properties in the ’90s. Now everyone and their mother are getting in on the online fantasy sports action, led by ESPN, NBC’s Rotoworld, Fox, MLB.com, NFL.com, Bloomberg Sports, etc. Fantasy sports, just like everything else, have also been making the transition to mobile, with news aggregating apps turning to fantasy sports (a la Taptu, Evri, and more). But few of the big media properties have gotten with the times and opened their data-rich platforms to indie developers and data hounds. Today, it looks like CBS Sports is leading the way, as it is officially opening up its fantasy sports service to third party developers, companies, and startups looking to create apps for their products and services. Considering there’s a thriving ecosystem of fantasy sports news, media, analysis, and data crunching sites out there, this allows them to build products that can live on CBSSports.com, exposing them to a host of new fans and revenue generating opportunities. CBS is allowing for both free and paid apps, though it will be taking 30 percent share of paid app sales. Yahoo, once arguably the leader (and pioneer) of online fantasy sports, also offers its own access through its APIs, but they only allow use off-platform and on a non-commercial basis, meaning you can’t sell apps. CBS Sports, on the other hand, is hoping that by exposing fantasy sports enthusiasts (of which the FSTA estimates there are more than 32 million — just in the U.S. and Canada) to a host of co-produced products and services and integrating them into their own products, it can make for a better overall user experience. Six companies (Advanced Sports Media, Bloomberg Sports, Rotowire, StatSheet, Major League Baseball Advanced Media, and Ziguana) have signed on as partners and will have free and premium apps available when “CBSSports.com App Central” — the app store — launches on January 31st. 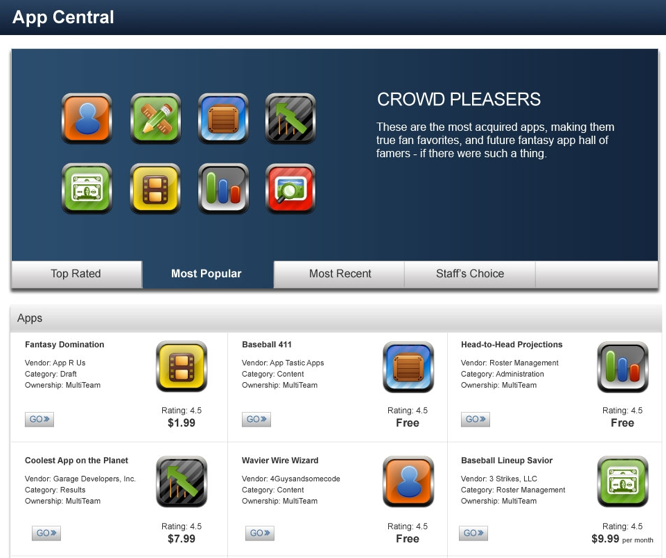 When App Central goes live, CBS Sports told TechCrunch, it will feature a rotating carousel at the top of the page that features different categories of apps, like “Staff’s Picks”, “Most Popular”, “Most Recent”, etc., following in the footsteps of other web app stores. The carousel will showcase up to eight apps in each tab, which are automatically/programmatically updated. It will also include App Lists, which will display apps by recently, and future iterations will include categorized filtering and search functionality. In preparation for the launch, CBS has already launched a “Fantasy Platform Development Center” to let developers learn how their products and services can work on the platform, including access to its set of APIs (which open up most of the data available on CBSSports.com Fantasy Games), and the tools needed to build customized fantasy apps. Developers can check it out here. It’s great to see CBS Sports following the lead of major tech companies, opening up their platform and data to third party developers, which is really a win-win for everyone involved. Surely, it will only be a matter of time before other big media properties follow suit, as fantasy sports (along with scores and stats) are the primary driver of traffic for most online sports properties. It’s a lesson to all companies — I mean, even EMI, a record label, is getting in on it — bring in the developers, and let the fun begin.